Retired faculty member Paul Reed, second from left, presents a check for $42,000 to Dean Lewis, left, dean of the College of Business Administration, and Jim Gaertner, SHSU president. Also participating in the presentation were Valerie Muehsam, assistant dean, and Roger Abshire, chair of the management and marketing department. Paul Reed is a big Notre Dame fan. He earned his bachelor's degree at that university in 1955, and will show you his Notre Dame ring at the slightest provocation. Reed still loves his alma mater, but he loves Sam Houston State University as well, as indicated by a recent gift of $42,000. Reed earned his Bachelor of Arts Degree from Notre Dame in 1955, his Master of Business Administration Degree from Northwestern State University-Louisiana in 1976, and Doctor of Business Administration Degree from Mississippi State University in 1983. After he left Notre Dame he had a 23-year career in the U. S. Army, joining the SHSU faculty in 1983 and rising to the rank of professor in 1995. He retired in August 2006 and was named professor emeritus. While on the faculty he was instrumental in developing the Human Resource Management major. In 1999 he and his wife, Jan, established the Helen Cochran Gilliland Human Resource Management Endowment Fund. 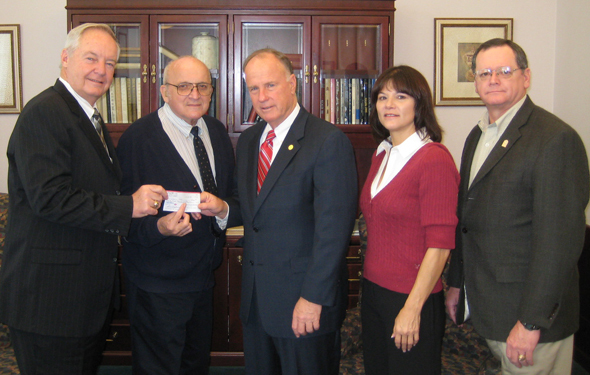 His recent donation of $42,000 was to establish the Emily J. and Paul R. Reed Human Resource Management Endowment. Over the years Reed and his wife have made donations totaling almost $100,000 to the scholarship funds and such areas as the volleyball program, the honors program, and the Smith-Hutson Business Building addition. "I've been blessed to have worked here with such wonderful faculty, students, and administrators," Reed said. "I'm so happy to be able to give something back." Jim Gaertner, SHSU president, thanked Reed and his wife for Reed's years of service and their monetary support during a meeting in Gaertner's office. "Your good work here will continue in the many students that your generosity will help earn degrees and become productive citizens," Gaertner said. "Yours is a wonderful record of service and thougthfulness." Some of Reed's accomplishments included being named the Southwest Case Research Association’s Outstanding Educator in 2001, serving as president of the SHSU faculty senate for two terms, and publishing more than 70 refereed journal articles, conference proceedings, and cases published in textbooks. Reed also served on the editorial review boards for many professional publications and served in various leadership roles in professional organizations. He received the McGraw Hill-Irwin Distinguished Case Award in 1999 and the Distinguished Paper Award in 2004. Reed served on 17 different University committees including the Post-Tenure Review Committee, Faculty Evaluation Committee, and Honors Council, and received the university's Excellence in Service Award in 1993.